I really like this idea for a design wall that you can take down when not in use, it would be great for an additional design wall for me and a place to hang a quilt when not in use. Love your version of Gertie, its such a fun quilt. glad your back sewing in your "new" room! I have a design wall on a wooden rod and then I put a rod in a tunnel at the bottom of the fleece like material and it hangs very straight and it hardly moves when I put individual blocks on it. Must be design wall day, Exuberant Color has the same subject for her post today! Great idea with your design wall and like that you can use for quilts when not in use....sounds like you are settling into your new sewing room.....enjoy! I can't wait to see what your first project will be, Thelma!! How is the quilt hung on that rod? It looks like little hooks or it's pinned instead of a sleeve, can you show a close up? Do you put sleeves on your quilts? I really like your Gertie, she's a beauty! Have a super day! What a great idea for a design wall - I may have to reconsider my plans. I've got a few boards of insulation that I was going to cover but I really like the idea of having a quilt hanging when the wall is empty. Thanks! Gertie is great!!! Looks like you're back in business! Gertie is a giant bear paw! I like it better than the pattern on which it was based! Love this quilt Thelma and your design wall is awesome ! Great size ! 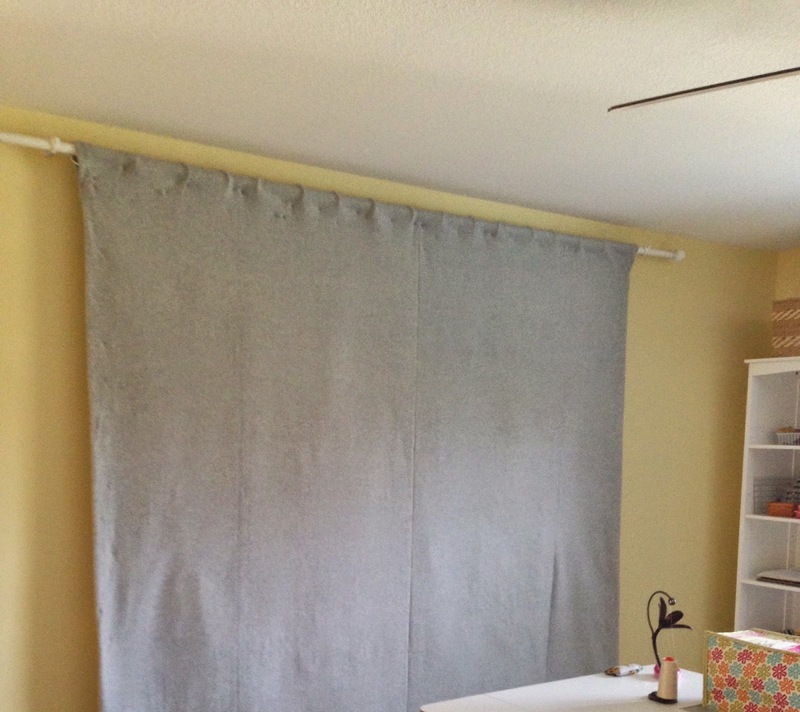 Your new sewing room looks great. Can't wait to see all the lovely quilts that you will be sewing in there! Gertie variation looks wonderful. Love your Daysail Gertie! I have a long list of "I WANTs" for fabrics. Time to start being selective or start shopping. I have the same idea for a design wall. I just haven't purchased the fleece or flannel yet. What a fabulous size for a design wall... enjoy! You certainly do look like you're back in business! The quilt is turning out so beautifully...as usual! I'm almost settled in, but deadlines have kept me from some final organization. It certainly will be good to say "I'm done too!" Hi Thelma! I am looking forward to the unveiling of your sewing space! Your version of Gertie is terrific -- I especially love what you did in the corners.